I woke up early and went to Les Deux Maggots where I met I woke up early and went to Les Deux Magots where I met Jim and Cheryl Michler, he was my boss when I first worked for Autodesk in Hong Kong. We had coffee then walked around St Germain. We went down rue des Canettes, rui Guisarde, through the Market. We stopped at Mulot and I bought them some pastries. 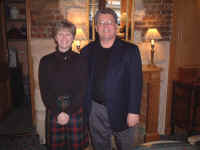 I dropped them off at Hotel de Fleurie where I took this picture of them. I talked with the nice owner of the hotel. He sends his regards to Nicolas and Nancy. I had a lot of trouble getting a taxi because it was raining, so I walked over to rue d'Assas and took the bus. I stopped and said hello at Les Mouettes. I had a very quick lunch at the Travellers. Damien was there with five friends. Then I took a taxi to Orly and flew to Perpignon. 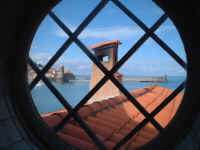 I picked a rental car and drove to the Hotel les Trois Mas in Collioure. Here is the view of the harbor looking through the round window in my bathroom. The Hotel is not what I might have chosen, but it is fun to be with my sisters. We all had dinner in the hotel restaurant and talked and talked.